You are here: Home / Uncategorized / Friendship Is Precious. And I Want My Son To Have a Friend. Friendship Is Precious. And I Want My Son To Have a Friend. “I want to have a party and invite all of my friends.” Norrin announced a few weeks before his 8th birthday. “Who would you like to invite?” I asked. I knew exactly what little girls he wanted to invite to his party. It made me smile. And broke my heart a tiny bit. Norrin’s “friends” were the sisters from the Despicable Me movies. Norrin also wanted the minions to come over -“the yellow minions, not the purple ones” – he was very specific in his request. The yellow minions are his friends too. I’m happy Norrin has taken interest in friends. And I’m happy Norrin has a sense of imagination. But I want his friends to be real not imaginary. For most kids, making friends is no big deal. I remember as a kid going to the park and making friends while I was there. Even during my most awkward stages of the tween and teen years, I always had a few friends. But for Norrin, friends don’t come as easily. Ever since his autism diagnosis (almost 6 years ago), we’ve had to work on play, imagination and engaging with peers. But who are Norrin’s peers? Playdates require work and have to be squeezed into an already full family schedule. It requires preparation, explanation and keeping close by. Typical kids Norrin’s age aren’t always interested in the things he likes; the older Norrin gets, the wider the gap becomes. 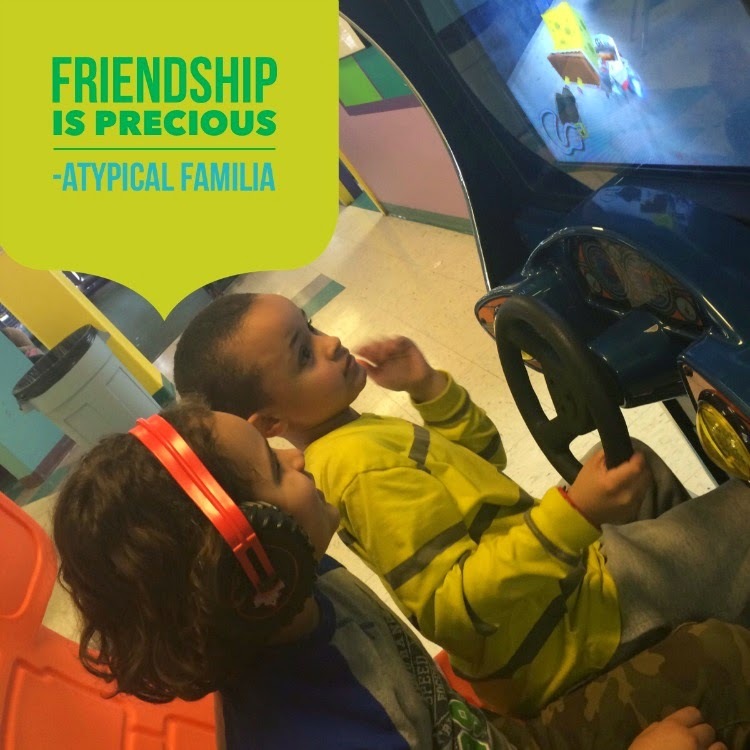 And kids with autism need to be “a good match” – conflicting behaviors can be challenging to manage during a play date. When you have a kid with autism, everything – even a play date – needs to be a teachable moment. I could not imagine my life without the love and support of my friends – the people who choose to be in my life and have held my hand through my journey, the people who love and accept me just as I am. I want that for Norrin. I want him to have a friend. I want to give him the tools he needs to make one and sustain one. Making a friend, has become one of our many goals for Norrin. And it’s just as important as any other life skill we want him to achieve. Over the weekend, I went on a mother and son double playdate. It was with a mother and son we have known for a few years. Our sons saw the same occupational therapist. I like the mother and her son is sweet. Our boys were good for each other. We went to one of those indoor playgrounds. We were like every other parent in the room, sitting on the sidelines, as our kids played. We watched as our boys ran around together and brought them back when they wandered away. Then we had lunch. Us moms sitting on one side of the table, our sons at the other. Just like friends do. And a party where Norrin can invite all of his friends, doesn’t seem so impossible.